Hartman Mouthpieces finally make this possible. As a trombonist, myself – I was frustrated by my inability to find a mouthpiece that worked for me and my trombone. I finally decided to try to find a solution by making my own mouthpieces and, after 20 years of trial and error, I’ve learned an incredible amount about how to manipulate a mouthpiece to make it do what I want. In the process, I’ve developed my unique philosophy of the function of a brass instrument mouthpiece, what we should expect from it and what it’s limitations are. The good news is that, now I can match a mouthpiece to your horn that will help you play easier in the high range, low range… play more loudly, more softly… gracefully, aggressively – all with a clear articulation and stability that will allow you to play with more confidence than before. The bad news is that there are limitations to what one can expect just from a mouthpiece. A proper mouthpiece matched to your horn will reveal your horn’s inherent characteristics – both positive and negative. Just like people, an instrument has a personality that can be refined but only to its acoustic limits. Some horns are born to be loud – some soft, some have a wonderful tone, some love to play high or low. But it is a rare horn that wants to do it all. If you find one of them, keep it! 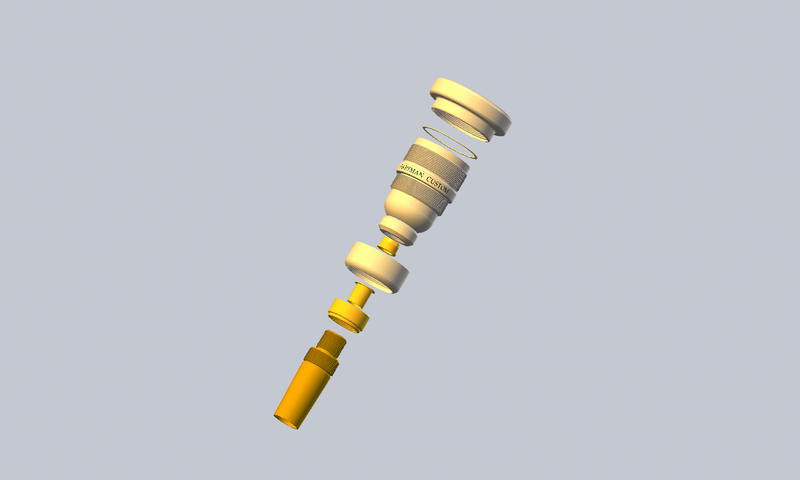 DESIGN: I have created a modular mouthpiece design that allows me to adjust and balance the primary parts of a mouthpiece for maximum affect. As you can see in the above graphic, I’ve designed the mouthpiece so that I can isolate and adjust various dimensions, i.e., rim size and shape, cup shape and depth, throat size, cup weight and backbore resistance. Without the ability to adjust these dimensions independently, you limit your capabilities to control a mouthpiece. My biggest asset as a mouthpiece designer is that I have developed the ability to buzz without a mouthpiece, which has made it possible to assess with confidence how a mouthpiece is translating what I buzz into it. If a mouthpiece responds and plays exactly the same as when you buzz without the mouthpiece (often referred to as free-buzzing) – then it is a ‘neutral’ mouthpiece. It efficiently transfers to the horn just what you are doing with your embouchure/aperture. Bizarre! It’s an incredible, liberating, feeling to have the mouthpiece and instrument respond in a familiar and predictable way! So in order to achieve this ‘neutral’ ability with a mouthpiece I have found that there is a specific balance of corresponding dimensions. And luckily, you can tweak this equation a bit to allow for several variations on *ideal* but the more you vary from *ideal* the more compromises you accept as a result. These variations on *ideal* are the power levels that I offer for each model. Power levels 6 and 7 are essentially *ideal* (neutral). As the Power levels go higher, the mouthpiece responds even quicker and the sound becomes more directional. Great for lead playing and aggressive articulation…As the Power levels head lower, response is gradually slower and slurring smoother. Great for nuanced playing required in lyrical, expressive music. When properly matched to your instrument, my mouthpieces not only allow your trombone’s true characteristics to emerge, enabling you to play with minimal effort and maximum affect, but you do have the option to tip the equation in your favor even more through using the Power levels to your advantage. For example, in a recent recital I used my A7 for most of the recital but I used my A6 for the vocal songs which allowed me more nuance in the delicate sections, then I used my A8 to play lead on some trombone quintets charts. So much easier to let the mouthpiece help you rather than otherwise!